I’m a writer in part because of the scary stories I used to hear around campfires when I was a Boy Scout. There was something wonderfully exciting in all the terrible possibility beyond the reach of the firelight. In my adolescence, I became a spook story junkie. Discovering Shirley Jackson’s The Haunting of Hill House was an absolute—and chilling— delight. I read and reread Algernon Blackwood’s The Wendigo. I checked out every book on my library’s shelves by H.P. Lovecraft. Naturally, the first stories I tried to write were scary short stories. In my twenties, I became “a serious writer.” For years, I labored to create the Great American Novel. In vain. Then, in the throes of a midlife crisis, I decided to write something people might actually want to read. I looked around and discovered that an enormous number of folks read mysteries. So I turned to writing crime, to pretty good effect. Thus far, I’ve published fifteen novels in the mystery genre. But I’ve never lost my love of the short story. Because most of what I write is dictated by contractual obligations with my publisher, I don’t write short stories as often as I used to. Usually I wait until I’m asked to contribute to an anthology. Then the juices begin to flow. These days, I publish one or two short stories a year, almost always of a criminal nature. I find them so very refreshing because, once I have the basic idea in mind, it doesn’t take long to create the work. And, oh, do I love the effect of a good short story. It’s like a blow from a prizefighter, quick, unexpected, and it leaves the reader stunned. Although I enjoy writing stories in the crime genre, it’s always a special treat when I can add a scary, other-worldly spin to the mix. Charlaine Harris, the creator of the stellar Sookie Stackhouse series, has given me that opportunity a couple of times. Most recently she and Toni Kelner, who’ve teamed many times to create best-selling short story anthologies, asked me to contribute to a collection focused on the recreational past times of not-so-human beings. I wrote a fun, frightening little piece I called Hide and Seek. 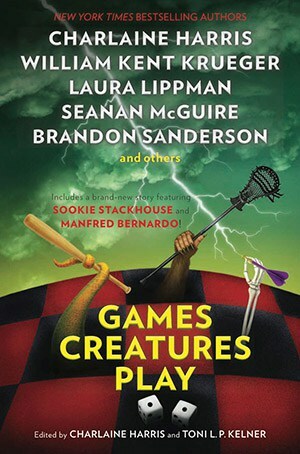 The anthology itself is titled Games Creatures Play. In addition to my story and stories by Charlaine and Toni, there are offerings by lots of stellar names in the mystery business: Jan Burke, Dana Cameron, Laura Lippman, and Joe Lansdale, to name just a few. The anthology goes on sale April 1. It will be available in bookstores everywhere and for purchase online. I hope you give it a read. And if you do, keep in mind that the chill you feel against the back of your neck might have nothing to do with your drafty old house.